One of the most popular of the many unusual varieties Steve and Marilyn Meyerhans grow at the Apple Farm in Fairfield, Maine. There were five or six Gray Pearmain trees in the orchard when they purchased it over thirty years ago from Royal Wentworth. Those trees were already very old. Unfortunately they never thought to ask the soft-spoken Wentworth about the origin of the apple. Recently John found a brief mention of it in a 19th centuryMaine Agricultural Yearbook indicating that C.A. Marston grew the variety in Skowhegan (very near the Meyerhans) over 130 years ago but with no further details. Its origin may forever remain a mystery. 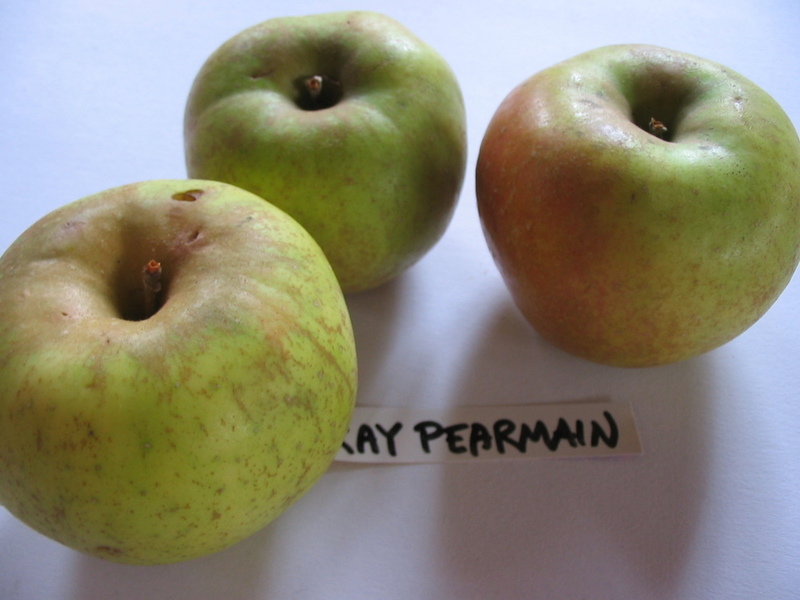 The skin is of the Gray Pearmain is a soft opaque greenish-yellow with a rosy pink blush, a bit of a russet veil, and a grayish bloom. If you close your eyes and take a bite, you might think you were eating a crisp, delicious pear. Gray Pearmain is a pearmain that really does taste like a pear – or at least we think so. It is the best of both worlds: a good mix of sweet and tart makes it perfect for eating out of hand. We eat a lot of them every year. Its firm, white flesh is juicy enough to press. Will store reasonably well, although it may shrivel like a Golden Russet. The Oxford English dictionary defines “Pearmain” as “An old variety of baking pear” or “Any of several varieties of apple with firm white flesh.” The most famous Pearmain is “Blue Pearmain”. The are many others, including American Summer Pearmain, Autumn Pearmain, Clark Pearmain, Davenport Pearmain, English Summer Pearmain, French Pearmain, Long Island Pearmain, Long Red Pearmain, New York Pearmain, Orange Pearmain, Orne Royal Pearmain, Oxford Pearmain, Red Pearmain, Russet Pearmain, Sebasticook Pearmain, Striped Pearmain, Summer Pearmain, Sweet Pearmain, Winter Pearmian, and Winthrop Pearmain.